What to do in Portofino? With gorgeous weather, a full day meandering ashore is perfect. A sky that matched a cerulean blue Crayola crayon. The breeze was just enough to keep a comfortable temperature, even in the sun. Our MSC Splendida western Mediterranean itinerary included a port call with a Portofino day trip. And here I was, on a bus from Genoa, zooming along the highway, towards Santa Margarita and nearby tiny Portofino. From the looks of it, the highway seemed like any other highway in America. I had to keep reminding myself that I was in Italy. Italy! Only two years before, I learned that I was half-Italian so this trip had a special meaning to me. Not quite sure how I’d feel or what to expect when I set foot in the “old country,” I kept looking out of the bus window hoping someone in my paternal family was from this part of Italy. I planned to just wander since I didn’t really know what to do in Portofino at that point. From ship to bus to ferry boat. Located on the northwest coast of Italy, Portofino’s closest major city is Genoa. Your ship may dock in Genoa and bus their guests for a 40 minute ride to Portofino. Another way cruise ships visit this charming town is to anchor off of nearby Santa Margherita. After a tender boat ride from your ship to the dock in Santa Margherita, guests may choose a 20 minute water taxi directly into Portofino Harbor. There is a scheduled bus that runs between Santa Margherita and Portofino, but since your ship will provide transport, there’s no need to get involved in public buses. Many cruise (and non-cruise) visitors choose to walk the 3-mile scenic overlook path between the two towns. You’ll find signs pointing the way to the Pedonale per Portofino. Walk west to the shoreline and follow the path into Portofino. 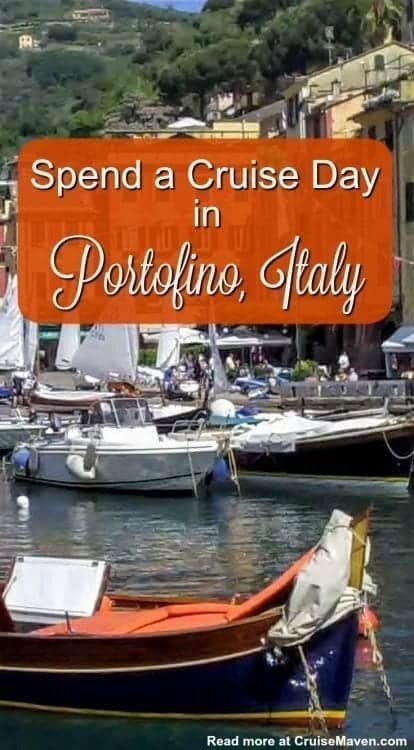 But the most dramatic entrance is when your ship drops anchor just offshore from Portofino and within minutes, your ship’s tender boat is docked alongside the town’s sprawling Piazetta, filled with cafés and visitors soaking up the Mediterranean ambiance. Our bus drove about one hour, across highways and through the mountains until we finally reached the quaint city of Santa Margherita. We had about an hour to stroll around the downtown, visit a church, grab an late morning cappuccino or gelato before we boarded the small ferry boat for the half-hour ride to Portofino. It’s such a small town that you can easily walk up, through and around it in one afternoon. Once you leave the port area and head over towards the shops and restaurants, there are several self-guided walks that you may choose. The streets are appropriately narrow and winding and of course quite cobbly, so be mindful of where you step. Checking out the little shops that lined narrow alleyways near the harbor. Walk up the winding cobblestone path to visit a medieval castle. Be sure to walk up the path from the right side of the harbor (as you face the town) to see the 12th century Church of San Martino. Back in the Piazetta again, take the path on your left up the hill to the small, simple yet beautiful Church of St. George. From there, continue along the walled path, past terraced gardens and beautiful overlooks to Castello Brown. This 17th century fortress has an impressive amount of historical artifacts and works of art. You’ll need to pay a few Euros to see the grounds. Walking from the harbor up to Castello Brown, the castle on the hill, built in the 1600s. Just follow the signs to Castello Brown. On the way back to the ferry boat, I stopped at a small bakery to buy an assortment of sweets to bring back to the ship for the staff in the MSC Splendida Yacht Club. You could smell the bakery aroma from a block away. Portofino and surrounding towns are known for their pasta with pesto sauce, a signature dish of the Liguria region. Being a fishing village, fresh fish is also very popular as well as their focaccia bread, served with olives, olive oil, herbs and cheeses. Highlights to shop for in Portofino include delicate lace and lace tableware, leather accessories and jewelry. Bakeries line the pathways and you can always buy a box of Italian cookies and candies to bring back to the ship. Keep an eye on the time so you don’t miss your ship. It’s never easy to say good-bye to Portofino. This is the Portofino that I’ll take home with me. Thanks for reading the article. It is a spectacular place to visit. Sounds like your next visit to “Portofino” will be entirely more interesting. What lovely images–both digital and your words. I will have a new appreciation of the Portofino restaurant near my home.